Westport Country Playhouse’s Family Festivities Series will present “The Story Pirates Greatest Hits Show,” celebrating creative writing by students in a sketch comedy musical performed by professional actors and musicians, on Sunday, February 24. The show is produced by The Striking Viking Story Pirates. 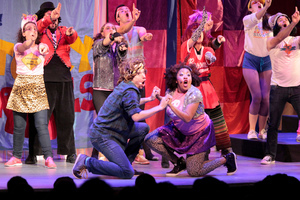 Performances are at 1 and 4 p.m., approximately one-hour in length, and appropriate for ages 4 and up. Tickets are $20 each. The performance is based on stories written by elementary school students nationwide, with part of the show made up on the spot by the kids in the audience. “Story Pirates” includes puppets, songs, and sketches. The Story Pirates’ Play/Write Program, from which the show’s stories originate, began in 2003 as a pilot in a Harlem school. It has grown to become a nationally respected creative writing and drama curriculum in place annually at over 200 schools across the country. Their assemblies and performances have been recognized and sponsored by partners such as Penguin Books and The John F. Kennedy Center for the Performing Arts, and on television programs such as “The Daily Show” on Comedy Central. The Story Pirates have a weekly show on Sirius XM radio, and an internationally popular podcast. Story Pirates has invited tens of thousands of students to see their own words and ideas come to life on stage, and watched as, one by one, these children began to call themselves writers. To enhance children’s experience of “The Story Pirates Greatest Hits Show,” The Westport Library will host a free-of-charge, hour-long program called “Story Explorers,” on Saturday, February 16, at 2:30 p.m., one week prior to the performance. “Story Explorers” will include activities surrounding the show’s themes led by staff from Westport Country Playhouse and Broadway Method Academy, the resident conservatory of Westport Country Playhouse. Presenting partners for “Story Explorers” are Westport Country Playhouse, The Westport Library, and Westport Young Woman’s League. Upcoming Family Festivities shows include “The Wizard of Oz,” on Sunday, March 17, when audiences will rediscover the joy of following the yellow brick road with Dorothy, the Scarecrow, the Tinman, and the Cowardly Lion as they travel through a reimagined world of Oz. The show is produced by Vital Theatre Company and geared to audiences ages 2 to 7. “Angelina Ballerina The Musical” will take the Playhouse stage on Sunday, April 7. Angelina is excited to show off her dance skills to a famous visitor from Camembert Academy, but will Angelina get the starring moment she hopes for? Based on the animated series “Angelina Ballerina The Next Steps,” the show is produced by Vital Theatre Company and appropriate for ages 2 to 7. In conjunction with the Family Festivities Series, the Playhouse will once again host a book collection for Read to Grow, Inc., a statewide nonprofit organization that provides free children's books to families with limited access and to community resources that serve them. At each Family Festivities performance, bins will be located in the Playhouse lobby for donations of gently used and new children’s books which will be given to families and programs in the greater Fairfield County area through Read to Grow. During last season’s Family Festivities series, the Playhouse collected nearly 300 books. Family Festivities Corporate Sponsor is Pitney Bowes. The Family Festivities Series is also supported by the Westport Young Woman’s League. All artists, titles, and dates subject to change. Everyone in the audience requires a ticket. For more information and to buy tickets, visit www.westportplayhouse.org or call the box office at (203) 227-4177, toll-free at 1-888-927-7529, or visit Westport Country Playhouse, 25 Powers Court, off Route 1, Westport. Stay connected to the Playhouse on Facebook (Westport Country Playhouse), follow on Twitter (@WCPlayhouse), and on YouTube (WestportPlayhouse).